In order to guarantee the factory new quality of our Stearman Restorations - in contrast to a common overhaul or rejuvenation - we are in cooperation with several companies in the USA, which are spezialized on components for the Boeing Stearman. They guarantee a constant supply with maybe not always the cheapest, but honestly speaking, the best quality components available on the market. Basically all the airframes we are offering are free of corrosion and well preserved since the time when the airplanes had been put out of service. This is a good basis to start with; as most of the Stearman were in use as crop-dusters and many of these airplanes have a real corrosion problem. The AIRFRAME, control surfaces and all other hardware are stripped to bare metal, inspected and in the end epoxy primed and painted. The aluminum fairings, stringers, longerons, sheet metal parts, etc. are reproduced according to original Boeing drawings and standards, again avoiding any potential corrosion problem. Needless to say that all items subject to wear, like tires, bearings, control cables, nuts and bolts are replaced. 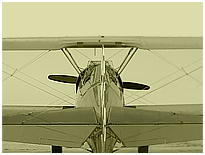 The WINGS are new production as well, rebuild with all new spars and ribs from BIG SKY STEARMAN, the prime source for wooden wings in the US. The hardware is tested and cadmium plated or primed, as appropriate. Covering of the complete fuselage, tail and wings is done with Poly-Fiber Heavy Duty-2 fabric, and in combination with multiple layers of dope, an UV protection and several top coats of paint this is a guarantee that the covering will last for decades. FIREWALL FORWARD only top quality components are used as well, like aA newly rebuilt, 0-time ENGINE from RADIAL ENGINES Ltd, our partner overseas. Their "factory new engine-overhaul" incorporates, for no extra costs, engine modifications like reinforced roller-bearings, dynamically balanced crankshafts and superchargers, improved alternator, shielded ignition harness, improved oil seals and many more, to ensure the maximum possible life-time on our engines, as on the airframes. The basic configuration of our Stearman airplanes corresponds to the original Boeing PT-13D (Army) and N2S-5 (Navy) set-up, powered by a 225hp Lycoming R680 engine with original Sensenich wooden prop. 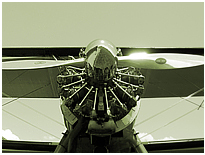 Besides we offer a variety of engines-versions of your choice, approved for the Stearman airplanes. Finally the airplanes are put though an EASA or FAA certification process, depending on the request of the future owner. Depending on the specific moment you are joining the restoration process of your future Stearman, you have the choice of various engines, paint schemes, and other equipment.